People now spend hundreds of dollars on the right gear for safety and the best bikes so make sure your bike/s are protected from damaging weather by choosing an quality storage solution. Riding bikes has always been a popular activity for leisure and family outings as well as for exercise. People now spend hundreds of dollars on the right gear for safety and the best bikes so make sure your bike/s are protected from damaging weather by choosing an quality storage solution. 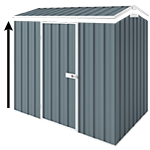 This 2.26m x 0.78m colorbond bike shed has double doors and a hinged roof. Made from superior quality steel and manufactured in Australia, the Absco Bike Shed is a perfect way to store your bikes securely, finished in a cream, grey or green colour. This shed is DIY and come flat packed with everything you need including a manual. You will need some tools and we recommend watching some of our videos before building. For permanent secure installation of your shed it is recommended to use anchors.